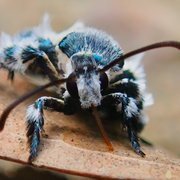 A scientist exploring the Amazon rainforest one night wasn't necessarily looking for bizarre animal behaviors, but that's what he ended up finding — twice. Leandro João Carneiro de Lima Moraes, a scientist from Brazil's National Institute of Amazonian Research, was researching frogs and lizards one night last November when he noticed a bird perched in a tree who had something — or someone — on his little head. Closer inspection revealed that the bird was asleep on the branch, and the someone was a moth who was gently slurping the tears out of the corner of the bird's sleeping eye with his proboscis, a long tongue-like appendage found in insects. Puzzled, Moraes went on his way — only to witness the same thing in another bird and moth pair just 45 minutes later. And this time he whipped out his camera to document it. 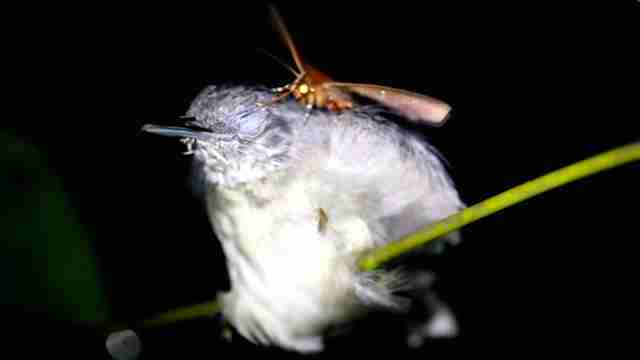 As it would turn out, while other kinds of animals have been documented drinking tears of other species (butterflies on crocodiles, for example, and bees on turtles) this is only the third time scientists have a record of "tear-feeding" by moths on birds. It's believed that the winged insects find the proteins and salt in bird tears particularly appealing. When the bird is sleeping, the moths have an opportunity to get what they need without disturbing the little birds, which is kind of sweet — still kind of creepy, but also sweet.